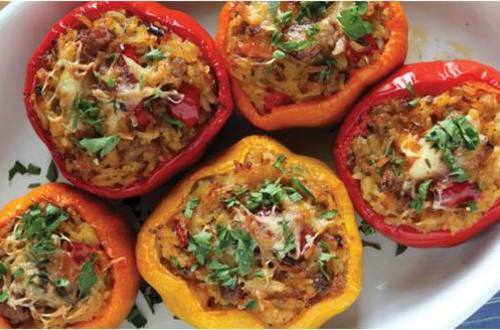 Stuffed capsicum can be served dry or with gravy. 1 Boil the potatoes until cooked. Remove the potato skin and mash them. 3 In a pan, heat oil, add cumin seeds and allow it to splutter. Add chopped onion and sauté well. 5 Add chopped green chilies, red chili powder, Knorr Chef’s Pav Bhaji Masala, salt to taste and cook well. 6 Add 1/2 cup (75ml) water. 7 Aded paneer and cook for 2 mins. 8 Add mashed potatoes and cooked peas. Mix well. 10 Put them on baking tray and bake it for 200 degrees C for 15 minutes. 11 Garnish with coriander leaves and squeeze lemon juice. 12 Served hot and Enjoy!